When looking at the city, I try to avoid thinking of it in terms of before and after. I prefer to concentrate on what is left standing and focus on the walls that have managed to survive the demolition teams. Sometimes though, digging around a building will turn me into an archeologist, and I'll begin to find notes and traces of a site's previous existence. When two such sites involve current incarnations as post offices, I begin thinking that I should dig deeper still. Oscar Wilde said that "fashion is a form of ugliness so intolerable that we have to alter it every six months". Whilst architecture may have a longer life-span than this, it is clear that it is subject to the same rules as other spheres of society. 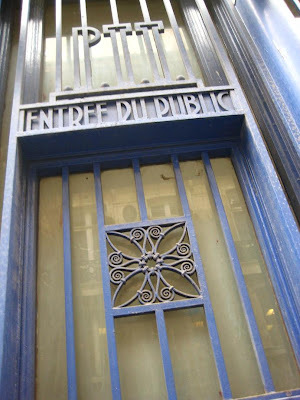 The corner of the Rue de Provence and the Rue Chauchat today houses a rather attractive Post Office building, decorative in a faintly Art Deco manner. It retains original signage, and even doorways that today lead nowhere. Little though would lead you to believe that you are standing at a point in the city where a fashion was created. This Post Office building replaced a previous structure which housed a furniture showroom and gallery run by an American named Samuel Bing. The name of this shop? 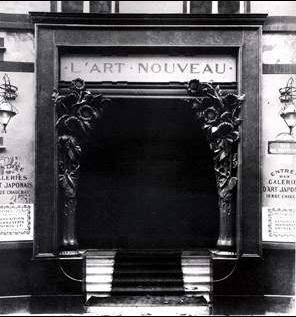 "L'Art Nouveau". Bing opened his showroom in 1895, selling objects reflecting this new style, but the only trace remaining of this era is the name he gave to the budding movement. The building was rented, meaning that he could not make changes to the external decor, but in any case, within 15 years the movement had blown itself out. I'm inclined to agree with the critic Jonathan Glancey who stated that it was a style "better suited to interior decor and illustrations rather than architecture", and the building that stands there today has sufficient merits of its own to justify its place. 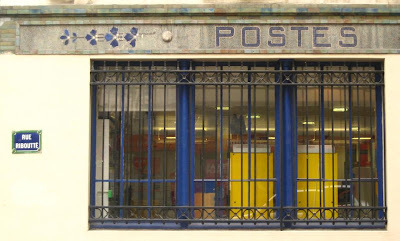 In the Rue de Douai, a brisk 10 minute walk away, another Post Office building but a radically different style from another era. This bureau occupies the ground floor of a curious 1970s office building, sitting beneath rows of individual office units at counterpoints. I find the building neither attractive or ugly, but rather an interesting attempt to break up the linear restrictions of the Paris streetscape. In such a historic area as this though (just south of the Place de Clichy), the chances were that this would be a concrete footprint on top of the skeleton of some dead fashion. It was a surprise though to learn that it replaced one of the most attractive and historic cinemas in the city, "L'Artistic", a place that showed the premières of both Eisenstein's 'Battleship Potemkin' in 1926 and Jean Vigo's 'Zero de Conduite' in 1933. As was the case with the Gaumont Palace nearby, the rise in the influence of television and other forms of leisure made the sheer number of cinemas in Paris unsustainable. There were inevitably victims such as "L'Artistic" that should perhaps have been protected, but this was not an era that favoured protection of the old. 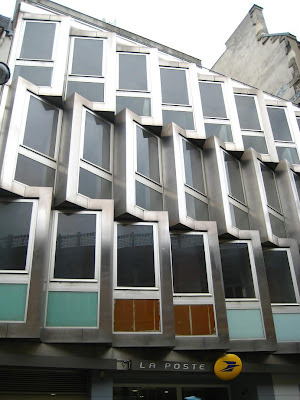 Today, my regret is that I never got to see the fantastic interiors of this building, a disappointment made all the more bitter when I have to suffer the crushing banality of the inside of a Post Office. For how much longer though will the Post Office hold its position in the streetscape? 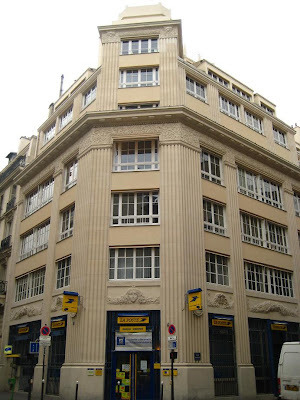 Throughout Paris, large structures remain, a throwback to the days when as the PTT they housed both telecommunications infrastructures as well as the standard postal services. Today, the buildings dwarf the downsized structures contained within, and with technology leading us further and further away from the centralised distribution of paper, it may not be too long before these buildings go the way of architectural modes and decorative cinemas. Mmmm, I'm sure I could do some interesting research on our own GPO whose architecture is quite similar to the one in your top photo, but I'm afraid I don't have your talent for digging into archives. The second post office is interesting too. Peter - I'm afraid I didn't credit it in the post but I took the photo of the Artistic from this PDF document. There are three other interesting photos in there, this time of the interiors. 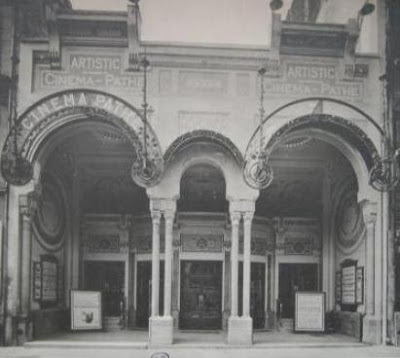 The document was one that was created with the goal of saving the similarly histroic Louxor cinema near Barbès, something which was successfully achieved (although when the renovations will be completed in today's climate is another story). Nathalie - I went out this morning and took a photo of the 'no tag' shop. I'll post it tomorrow and credit you! It's unfortunate, but it seems inevitable that the presiding 'Lords of Fashion' will exercise their power to destroy and replace past works with memorials of their own choosing. In Helsinki on Katajanokka Island where there is an astonishing collection of Jugend Style building, a particularly beautiful one was torn down to make way for a glistening pile of white marble by Alcar Aalto - now itself an historical monument... and so it goes. I find that building with the (illusion of a) rotating metallic facade to be somewhat threatening. 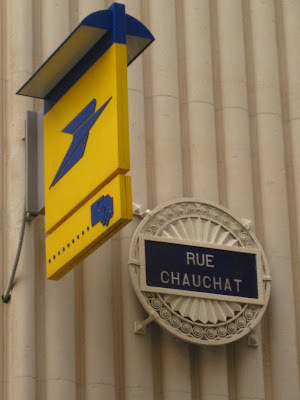 I like the building on rue Chauchat (of course, I never got to see the one it replaced), but I much prefer the old L'Artistic Cinema to the new building. A mon avis on ne peut prédire l'avenir. Le cinéma a bien "renaquis" (moi qui suis française de naissance je ne sais le participe passé de renaître et j'ai la flemme de chercher dans le dictionnaire) de ses cendres tel un phoenix. Sans doute à cause des subventions, des règles des quotas, qui sait à quoi tient l'engouemnt du public. En tout cas c'est spectaculaire, le cinéma français se porte bien. Je me suis aussi fait une réflexion qu'appuie ton message : la mémoire est courte. On oublie vite ce qui était. Pour exemple je citerai nos fameuses "lignes jaunes" françaises, qui sont devenues blanches dans le paysage... Alors à plus forte raison, on ne peut prédire l'avenir. A fine piece of archaeology! L'Artistic looks amazing, but at least the piece of 70s architecture replacing it is more interesting than most.